The ultimate weapon in any narcissist’s arsenal, the selfie, has made its way over from Grand Theft Auto V’s sunny Los Santos to the fourth game’s Liberty City. The game might be six years old, but continues to see modders put a lot of effort into expanding and improving it. 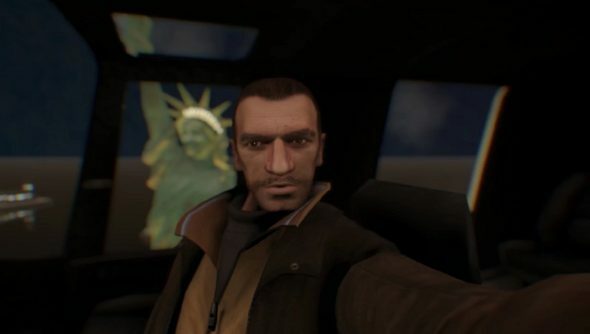 Now Niko can be a proper tourist, taking photos of his own face with Liberty City’s landmarks behind him, blurry and not quite in frame. If it got in the dictionary – the arbiter of all that is cool – then it might as well be in GTA IV. Niko’s phone isn’t set up for selfies unfortunately, but the mod adds a menu and, with a bit of wizardry, allows players to transform the normally grim crook’s face, making him expressive or even, incredibly, happy. If the idea of Niko becoming obsessed with himself strikes your fancy, you can download the mod here.